Custom metal fabrication is an intricate and delicate process which requires experience and considerable attention to detail. As with many specific trades, maintenance on metal fabrication equipment and tools needs to be well thought out with tactical planning. Unfortunately, because most welding equipment is used in construction, farming, automotive, and other “rough” use industries, maintenance can often be postponed or unnoticed. Metal fabrication comprises of metal being bent, shaped, and joined. From there, components and assemblies are made based on the customer’s specified designs. To fabricate these parts, industrial metal fabricators rely on turnkey machines, equipment and tools. The first stage of any custom metal project begins with the layout and detailing department where the details of the project are fleshed out and broken down into the parts required for the fabrication. These designs are then programmed into the shop’s plasma cutting machine for parts cutting. From this point, all work phases are detailed out with packages to be delegated to the correct workstations. 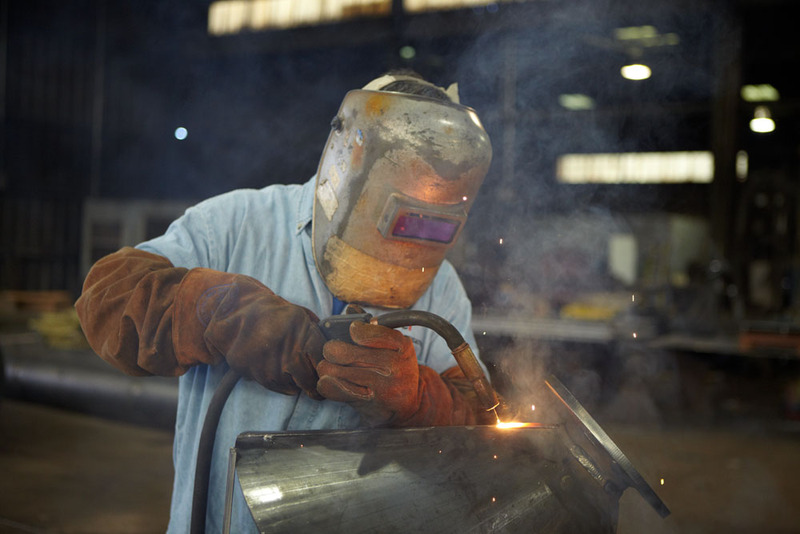 The welders then carefully manually cut, bend and assemble one-of-a-kind parts for their customers. Large assemblies present a challenge for all metal fabricators because some weldments can weigh up to 40,000 lbs., making automated machines useless. These assemblies require careful planning because several aspects must be welded in a sequence to avoid closing off or locking out future areas which will require added assemblies. Other processes, such as planning sub-assemblies, fixturing and handling, become difficult on large and heavier fabrications, as well. The nature of custom fabrication also involves flexibility with fabrications requiring multiple angle changes to put the weldment in the proper position. Welders must crawl in and out of the weldment to achieve the right positions and angles required to complete a project. It’s important to keep overall tolerances of the project in check to know when to skip welding in certain areas, when to use cooling rags and when to add additional bracing or stiffeners. There are many things to consider when planning for welding maintenance. First, all welding operators should know the duty cycle of the equipment they are working with. A duty cycle for a machine is based on the number of minutes out a 10-minute time-period of a machine can be operated at its rated output. So, if a machine has a 60 percent duty cycle, then it can be used for six out of the 10 minutes on a recommended number of amps. If the machine is used more than suggested, it can become faulty and dangerous. Along with the duty cycle, the purge gas hoses also need to be monitored. The welding operator should purge the gas hoses to expel all air and moisture condensation from their lines before welding. Entrapped gas impurities in the line can cause porosity in the weld bead and poor bead color. Porosity can also be caused by condensation or loose fittings in the gun or TIG torch and a defective gas hose or loose hose connection. In addition to protecting the welding equipment, also it is also important to protect the operator’s safety. One way to properly work with heavy machinery is to wear the correct clothing. Welding helmets should be fitted with an appropriate filter shade to protect the operator’s face and eyes from intense and invisible arc rays which can burn eyes and skin. Approved safety glasses and side shields should also be worn along with installing screens or barriers to protect others in the workplace from flash and glare. Other clothing suggestions for optimal safety is to wear high-top leather boots and avoid pants with cuffs as they can catch sparks. The area surrounding the welding operator also determines the operator’s safety and maintenance upkeep of welding machinery. The space can be subject to dangerous light, heat, smoke, sparks and fumes. Permanent booths or portable partitions can control light rays to one area. Welding should also not be done in areas containing flammable gases, liquids, vapors, or dusty locations where explosions are a possibility. To protect from harmful fumes, an exhaust hood or booth should be used to remove fumes from the area. 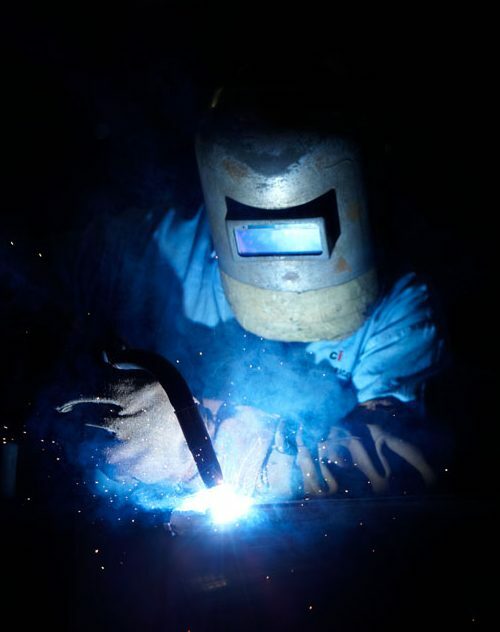 When welding in a confined space, welders can be provided air masks or self-contained breathing equipment. 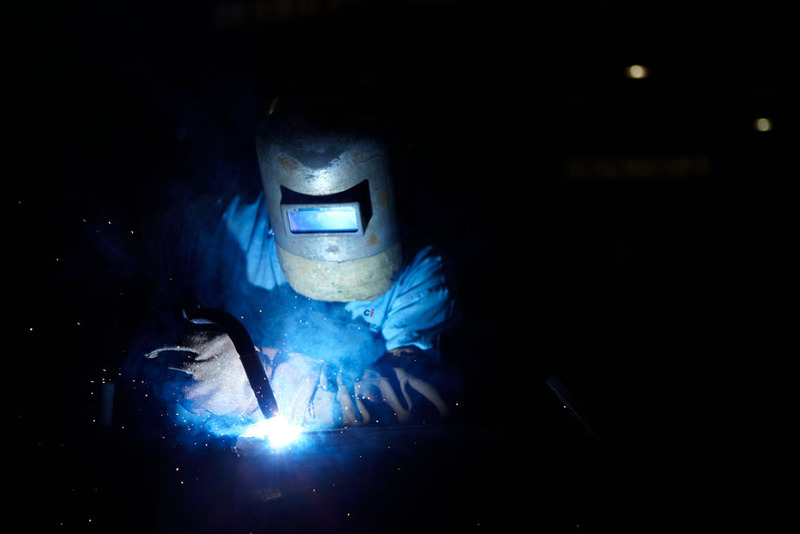 To keep welding equipment running properly, one must use the correct materials. Flux-cored arc welding (FCAW) is one welding technique welders use often. FCAW should only be used on mild and low alloy steels, a few high nickel alloys, some wear facing/surfacing alloys, and stainless steels. Metal inert gas (MIG) welding is another common welding technique, especially for beginners. The solid MIG wire does not combat rust, dirt, oil or other contaminants very well so it is important for the welder to prepare the metal correctly. As all metal fabricators know, certain materials are more challenging to weld and control than others. One of the most difficult to weld is stainless steel because it presents challenges in discolorations, weld appearances and keeping the weldments from warping and bowing due to expansion then contraction of the metal during the heat application to the cooling process after welding. Stainless steel requires some tricks to keep welds straight and within tolerances, including monitoring the temperature for the weld metal and base metal. Failing to stay within the specified temperature ranges results in poor performance of the material. Therefore, it’s important to check the temperature of the steel in one of three way: temperature-indicating sticks, electronic infrared thermometers or electronic surface temperature probes. Joining dissimilar materials is a common practice in custom metal fabrication as it allows for the creation of tailor-engineered parts, but it is often more complicated than joining the same two materials. This presents a set of challenges as a part may need high-temperature resistance in one area and good corrosion resistance in another. Parts may need toughness or wear-resistance combined with high strength or many dissimilar materials can be joined with specialized procedures. This includes knowledge of proper welding wire or electrode of the metals. Because of their durability and long life, welding machines may not get routine maintenance as often as they should. A broken welding machine or tool can cause several issues including lost production, expensive repair, wasted energy, and blown electrical components. These delays lead to unplanned repairs and missed deadlines. It is important to keep up with the equipment’s preventative maintenance before it becomes a bigger problem. Ci Metal Fabrication, located in Meridian, Miss., is a nationally recognized leader in custom industrial metal fabrication working with metals utilizing highly skilled craftsmen while meeting precise specifications in presswork, power forming, welding, cutting, and shearing. With more than 40 years in business, Ci Metal Fabrication has extensive experience working with the power generation, pulp and paper, chemical and automotive industries. Ci Metal Fabrication is a subsidiary of MHS Legacy Group, a St. Louis based holding company with roots dating back to 1895. Next articleLease Accounting Changes: Is Your Shop Ready? Steven Guisgond is the General Manager at Ci Metal Fabrication, a nationally recognized leader in custom industrial metal fabrication working with metals utilizing highly skilled craftsmen while meeting precise specifications in presswork, power forming, welding, cutting, and shearing.